A young grizzly bear emerging in early spring searching for food in Yellowstone National Park. 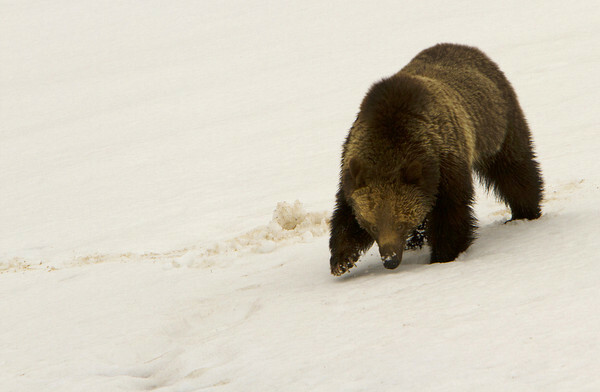 This Grizzly was digging down with his 4" front claws and nose foraging in the snow along the road and caused a traffic jam. I took many images of this bear,and in all of the images he did not lift his head or make any eye contact. If you are ever approached by a bear do not make eye contact, they might percieve this as a challenge or a threat. There were many people following him and one lady was actually chasing him when a park employee warned her to back off and be careful. I'm very surprised to see how many folks are unaware of the speed and power of these creatures.